I am posting this in answer to a question about the FUZZIES! You know, all those stray wool fibers that stick out all over the place that make your felted sculpture look like it’s in soft focus!! You take a photo of your feltie, and it looks like wires are sticking out. LOL! What to do??? Get the SCISSORS and trim, trim, trim!! Yes you do have to trim off all those stray hairs!! DO NOT pull them instead, or a chunk of felted fur may come with the strays. 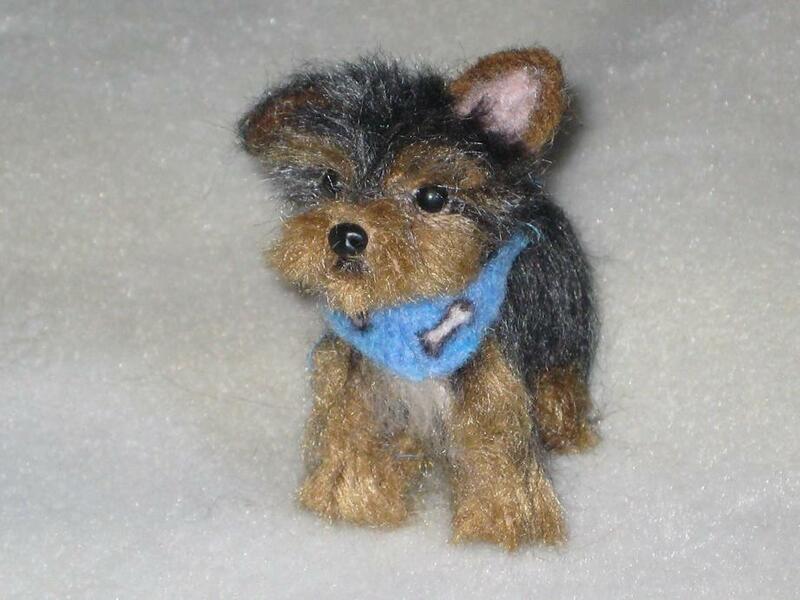 If you give someone a feltie, please give them grooming instructions to keep their feltie looking great! After spending so many hours felting the final touch is GROOMING! I sometimes take 30 minutes to groom a feltie. NEVER use a comb or brush on felted fiber….remember, it is felted in, not Glued! DO NOT USE A FELTING NEEDLE. This is one on the main ways that felting needles get broken. Please see my 2 posts on “Why do I break needles?” I use a large sewing needle to gently “comb” the fur and trim, shape, thin, groom until I’m happy with it. The final grooming gives the finishing touch on your felted sculpture . This is what I send out with every feltie that I make. Trim off stray hair. DO NOT pull out. DO NOT brush or comb the fur. Use a large sewing needle to GENTLY “comb” the fur to arrange. Fur is felted in, not glued. Here was the question. Thank you for your great question Monica! Welcome to my blog! The reason why you got the urge to trim with scissors was because you need to trim with scissors!!LOL! Did someone tell you that you couldn’t? I hope that I answered your question 🙂 Thank you for your kind words on my felted creations! TEE-HEE-HEE!!! This post makes me so happy!! Thanx for sharing your thoughts on “fuzzies”. I hate “fuzzies”!!! I always trim my sculptures with scissors, usually have to do it 2 or 3 times cause I always find fly-aways!! I also wanted to add a tip…. I like to go over the surface of my felt with a nice fine 40g needle. this tightens up the surface fibers & helps get a nice solid felted skin. Then it’s time to trim, trim, trim!!! Yes that is good to use a fine needle on smooth surfaces. I am also referring to grooming long fur in this post. BOTH need extensive grooming and trimming! It is also true that some wiry or crimpy fiber may make more strays that others. If you do have stray fibers, feel free to trim. Love your felted food! Thanks for being so generous in sharing your expertise with everyone! I NEVER put anything on my long coats! Include grooming instructions with the sculpture and it can easily be fixed. I like my fur to be soft and fluffy. I would be worried about chemical sensitivities and yellowing if using hairspray. As I don’t use hairspray, I’m not familiar to what happens to it when it ages on fur? I spent so many hours on my sculptures, I wouldn’t want to risk ruining it! Thanks so much for answering my question! I just had never heard about trimming finished pieces before but I’m glad that my instinct to want to trim was right. 🙂 And now I can’t wait to try something with a long coat! Once again! Great tip Gerry! It really is weird how instinctual this craft really is. Your blog is coming along nicely too. for grooming the hair I use my broken needles(which there are a lot of I’m afraid) They hold up nice to grooming out small bunches and fuzzies. Yes I do the same thing! Best to use the broken needles rather than use a good one that may end up broken from the sideways pressure of grooming right? I’d say the times I like your work very well. I know also felt since 5 Monatenund what kind of work. I would have got a question, there is a forum where you can improve. Do you mean Needle Felting Forum? Angora bunny fur…impossible to felt without it going everywhere and eating some! !LOL!.